5 Weeks 6 Days - Two to Stay? Twins now, but to last? This morning had an ultrasound at 5w6d and there were two sacs: one measuring 5w5d and one 5w4d. She said definitely both sacs have something in it, but not to assume it is twins yet, that we will do another sonogram in two weeks. How frequent is it that one disappears? I've already wrapped my mind around this I think, so I want to see if I need to back up. Also, if she described as "two egg sacs", that means fraternal, right? This view is the only 2-D slice that shows them both clearly, but both black area things are about the same size and have some sort of things in them that aren't really identifiable to my eye! Comments for 5 Weeks 6 Days - Two to Stay? 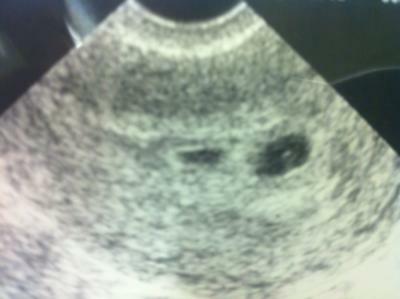 That's quite an early ultrasound, but definitely is two and the more likely outcome is they stay two. And two egg sacs can be identical that separated early, but fraternal are more common.